Photo provided by: "Frantic Ford"
This picture had been in hiding for over 40 years! It’s on the Patterson Family farm – probably sometime in 1969. Standing on the right rub rail is Shirley Patterson. On the left fur rail, the little fellow is Robert Bruce Patterson and the blonde haired fellow is Mark Yaple. If you look close, Bob Patterson is behind the wheel. Bob came out with this car in 1968. Back then Bob was using 292-312 Y block Ford power, backed by the old 37 Ford transmission, hooked by a torque tube driveline to a 6 spline quick change rear. Those rears used the 37 Ford axle tubes and the smaller 37 Ford car ring and pinion. I/m pretty sure that Bob built the car on 1956 Ford chassis rails. In those days, just about everyone was using 1955 to 1957 Chevy chassis rails. At the end of the ’68 season, the old Y-block gave up the ghost. 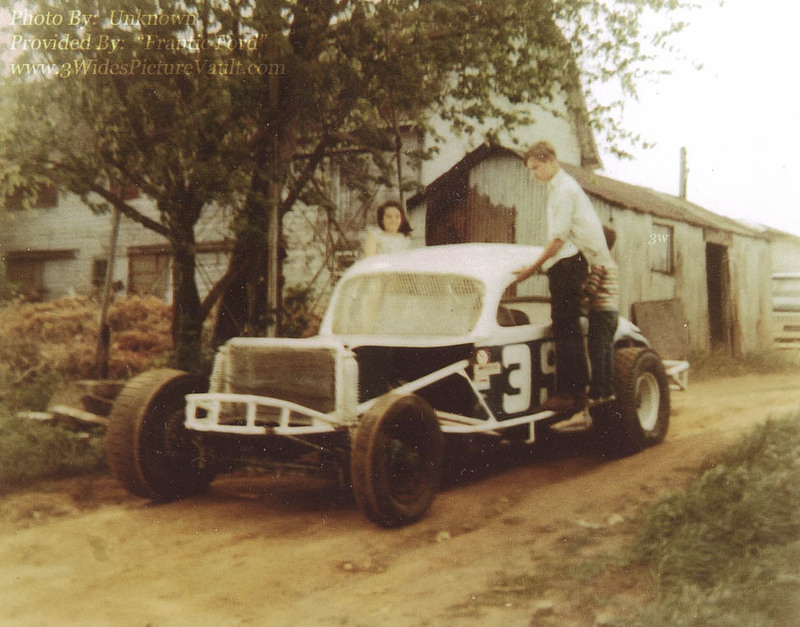 Back in these days, Pleasantville Speedway held a big 50 lap race at the end of the season. Bob asked his good friend Al Whitehouse if he could use Al’s “Ronnie Buck Prepared” 289 Ford power plant for a trip to AC. Al gave Bob the OK, and Bob had to change mounts to install the small block Ford power plant. Bob did remark, “I don’t think that 6 spline rear will stay together on the blacktop.” Sure enough, a broken rear ended Bob’s run that day at Pleasantville. For the 1969 season, Bob got together his own 289 Ford power plant. He backed it up with a then late model Mustang 3 speed transmission and a ¾ ton Ford truck split floater rear. Under the front, he installed a truck axle with twin radius rods. The twin radius rods were made from shortened truck tie rod ends. They worked good and were a lot cheaper than a bunch of heim ends. Bob had made many trips to the Red & Black junkyard in Jamesburg NJ for many of the parts for this car. These were the days when a car was truly a fabrication of a person’s Mind and Means. Bob and Margaret Patterson and their family were some of the BEST people I’ve ever met. Great photo. I'm Lynn Whitehouse's cousin (Lynn is Al's wife) and I've been around hot rods since 1955 or so. While sitting with Lynn at New Egypt Speedway about a month ago, I got the opportunity to chat with Margaret Patterson about the good old days. Great lady. Bob ran back in the day when you either took it (parts) off a junked car (or truck) or made it yourself. He was a great guy who raced in a special era. 10.31.13 3-Wide I don't remember this particular car, but I remember the version with the kinda stenciled #'s on it. Definitely a car that I relate to my early days' of going to see the Sunday afternoon races at East Windsor Speedway.